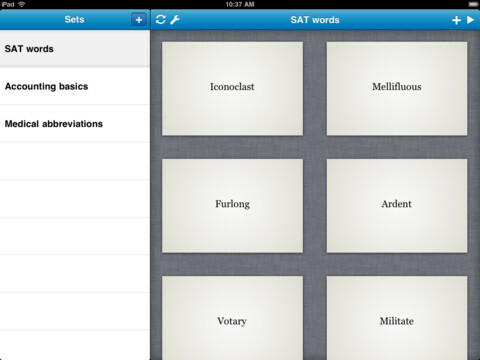 Cramberry is an app that helps you study using your iDevice. It allows you to create and use flashcards virtually. It can be used both on your PC/Mac and on any iPad/iPod/iPhone, etc. The user creates an account and all flashcard groups are saved and transferable multi-platform. Easy to use interface, seeing both sides of the card at once. Easily create and delete cards. Study with ease on the go. No need to carry around dozens of notecards in your bag. Cramberry is a great simple app to use for studying; however, its $3.99 price tag just doesn’t seem to be worth it for the fact that there are many more flashcard apps who can do just as much and more, for free. There is also a lack of organization in that you cant sort your notecards as well as you can in some other apps. IMHO, not worth it.